It's easy to upgrade your next bath with one of these simple recipes for relaxation! A relaxing bath starts with a relaxing atmosphere. Here blue and white create a serene space. 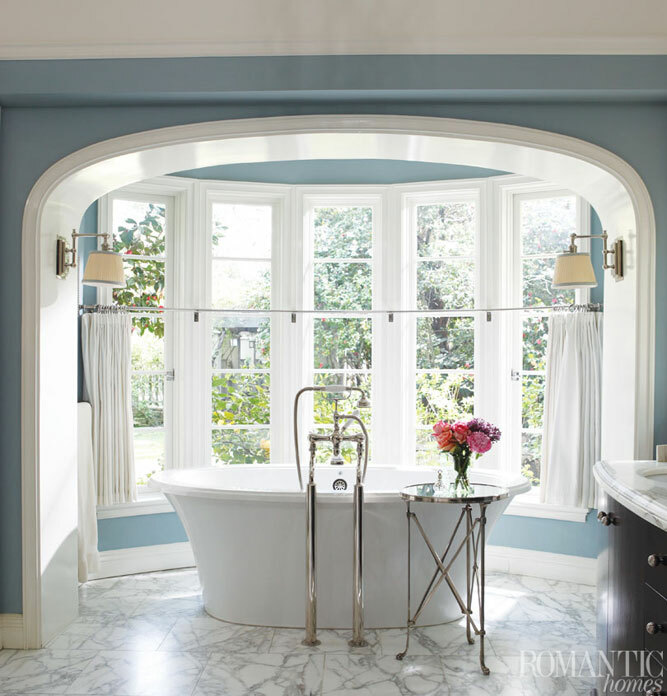 A gorgeous bathroom demands a special beauty treatment. But you don’t have to spend a lot of money on luxury products. Here are some recipes for creating your own soothing bath treatments at home, for a fraction of what you’d spend at a spa. As an alternative to bath salts, bundle lavender, chamomile, peppermint and rosemary in a cheesecloth pouch or large metal tea strainer. Leave in the hot water for the duration of your bath and you’ll emerged feeling relaxed and energized. Pre-filled bath sachets make great gifts too. Blend eucalyptus and peppermint essential oils with almond or coconut oil (use 10 drops of essential oils to every ounce of the carrier oil). Store in a small bottle and use 1 tablespoon in your bath to rejuvenate your senses. Combine 2 cups powdered whole milk, ½ cup cornstarch and ½ cup of baking soda in a glass jar and shake well. Add 10 drops of your favorite essential oil, shake again and let it sit for 24 hours. Pour one to two cups of the powder under warm running water to moisturize, exfoliate and soften skin. Did you forget about that bottle of wine in the back of the fridge? It may not be good for drinking any longer, but it can still benefit you. Pour a glass or more of champagne or red wine into the water when you run the bath to lighten skin, reduce discoloration and cleanse pores. Not just for treating skin rashes and sunburn, an oatmeal bath can soften the skin, reduce acne and revive aging skin. Fill a new, knee-high stocking with a cup of oatmeal (not instant) and tie at the top. Toss it in the warm water, and squeeze it occasionally to release the oatmeal-infused water. You can even use the stocking to give yourself a good all-over scrub. Mix a cup of a light oil, like baby, almond or sunflower oil, with a half cup each of honey and unscented shampoo, and a teaspoon of vanilla extract. Shake well before adding a quarter cup to your bath. If you want bigger bubbles, add one egg white into the mix. Combine four cups of Epsom salt with 2 tablespoons of unsweetened cocoa powder. Epsom salt is good for soothing aches and pains, while the cocoa will help keep your skin clear and hydrated. Try combining this with a milk bath for an extra luxurious soak! The perfect bath isn’t complete without quiet music, soft candlelight and a plush towel to wrap yourself in when you’re done. To stay hydrated while you soak, avoid diuretic beverages before, during and after your bath. Instead of tea, coffee or wine, try cool lemon water. And don’t rush yourself—a good bath should last at least 20 minutes to give time for the oils, salts and other bath ingredients to really work.